In 1937 Al Moen wanted to wash his hands after a hard day at work, and was so annoyed that he was met with scalding hot water he decided to think about designing a one handle kitchen faucet instead of the traditional two handle. In 1939 his invention was complete and soon after in 1947 the single handle kitchen faucet was ready for manufacture. 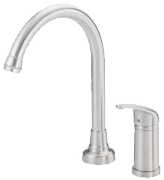 Since then, Moen has continued to update their kitchen faucet designs and on my website you will find the latest in MotionSense technology. It’s amazing how far this company has come in terms of world recognition and innovative design that makes life easier and more hygienic in the kitchen.